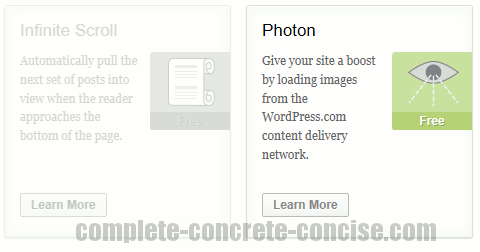 Photon works by using wordpress.com to cache and serve up images from your site. Since I am always looking for ways to reduce my bandwidth (and speed up performance), I enabled it. The 20th, 21st, and 22nd averaged about 3% fewer page hits than on the 25th – but it is obvious that (with Photon enabled) I used less bandwidth on the 25th . The 23rd and 24th are the weekend, so there is always a drop in traffic. I suspect the spike seen on the 24th is related to enabling Photon. Based on very limited data, Photon appears to be working well and is saving me some bandwidth. It does not require me to change anything about my site (always a serious bonus). As the screen capture shows, in approximately two days, there have been 204 clicks on cached images (the cached images have the URLs i0.wp.com, i1.wp.com, i2.wp.com), whereas, the other 5 days there were only 13 clicks on images on my site. One problem I have noticed while using Photon is that when I update an image on an article (i.e. replace it), the change is not reflected in the cached version. I tried disabling Photon and then re-enabling it, but it didn’t pick up the changes. I will have to see if the changes get picked up at a later time – at the time of this update, it has been about 3 hours.